Public waste containers help keep outdoor spaces neat and inviting and encourage community participation. These ASTM compliant precast concrete receptacles offer a durable solution with modern 2-way opening dome lid is perfect for outdoor spaces. The 2-way dome top keeps precipitation from accumulating inside and litter on the outside. 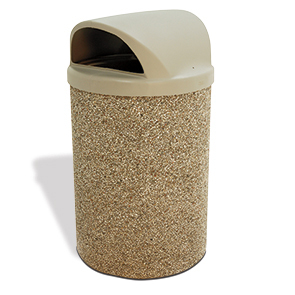 Made from durable polyethylene, this lid is easy to keep clean and will not dent, chip, stain, fade, rust or corrode. Security cable comes standard, liner is optional and sold separately. Constructed with steel rebar reinforced concrete available in standard and premium finishes to suit any design theme.